Mayfield Park Cottage and Gardens recently completed a much needed erosion control and wall stabilization project near the stone archway. The focus was the area leading to the gazebo, which overlooks a dramatic bluff and natural area. 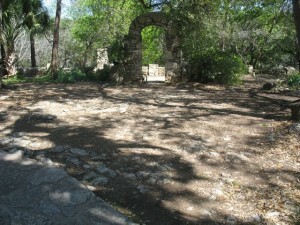 The walkway to the arched gazebo, dating from the Mayfield-Gutsch era, was eroding. Site of many wedding ceremonies as well as more casual outings, the pathway had become a challenge to those treading between protruding rocks. Mayfield Park/Community Project (MP/CP) contracted with historic landscape architect Catherine O’Connor to correct erosion, landscape to protect the soil and live oak trees, reconstruct part of the low stone ledge that had crumbled over time and create a walkway that was no longer a safety hazard to those who could easily twist their ankles. With substantial help from Austin Parks Foundation, along with community support and oversight from Parks and Recreation Department, the erosion control and stabilization project was completed. Because the live oaks had grown so large that the sun could no longer peek through to sustain the grass that had formerly grown there, it was not possible to restore the exact landscape that the Gutsches created. 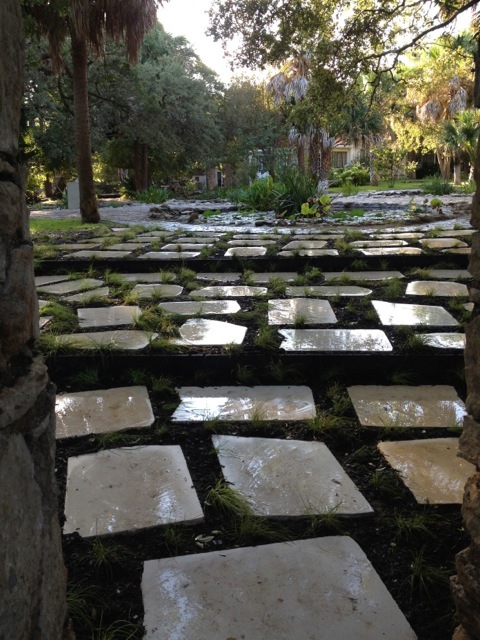 Larger, irregular limestone steppingstones now form a new walkway, with sturdy sedge landscaping leading from the limestone patio and ponds, creating a similar look without trying to restore an exact replica of the Gutsch era.The area by the arch gets a lot of foot traffic as it is a popular place for pictures and ceremonies. The Mayfield Council arranged to have the area repaired with flat pavers and sedge groundcover. A watercolor image of the Mayfield Cottage.